Openlava is a limited fork of an old version of platform LSF, which allows job scheduling on multiple nodes. The scheduler is designed to work in large clusters but can be used to schedule jobs on a few nodes as well. Managing openlava is limited to the CLI but to get an overview of the running and planned jobs in openlava, I will also install Openlava web which is created by David Irvine. Openlava itself has a clear documentation, the webgui part isn’t that good documented, especially if you don’t have a lot of experience with Django and Python packaging. In this post, I’ll install openlava on two nodes (node01 and node02). Node01 will be used as the master. The firs thing we’ll do is install openlava on two nodes and get them to communicate and schedule jobs. As with many of my posts, I used CentOS 7 to put this together. Once we get the scheduler to work, I’ll add the web interface on top of it. setMyClusterName/ls_getmyhostname failed: Above fatal error(s) found. init_res: ls_getmyhostname() failed, Bad host name. Although this step is optional, it’s highly recommended. By default, openlava is sending a mail when a job finishes in the schedule. This mail contains more information about the job and the job’s output. In order for this to function correctly, we need to configure our hosts to allow them to send mails. Sending mail can be done in a lot of ways. The most popular packages for this are Sendmail or Postfix. This time, I’ll configure Postfix. I’ll only put the actions and output here for node01 but you need to apply the exact same configuration on node02. If you want to, you can set your SMTP-server as relayhost in /etc/postfix/main.cf but I’ll let each host be it’s own relay so I don’t need to touch any of the configuration files of Postfix. In case you experience problems with mail, you can check the contents of /var/log/maillog. The last step of the preparation is to open the necessary ports in the firewall to allow communication between both nodes. Although there are four fixed port numbers in the configuration file /opt/openlava-2.2/etc/lsf.conf, I noticed that openlava also uses dynamic ports to communicate and they’re somewhere between 1024 and 65535… Unfortunately, I couldn’t find any clear information about this in the documentation and on the mailinglist, people only suggest to stop iptables. So the best I could do is to allow the range of ports through the firewall. # See lsf.cluster(5) and the "LSF Administrator's Guide". This file needs to be present on both nodes with the same content. During RPM installation, openlava was automatically started so in order to let the changed configuration become active, we need to restart it. Openlava still used init scripts while, since CentOS 7, systemd is used. For now this isn’t really a problem but it would be more clean to create a systemd service file openlava too (maybe later). The init script is using the killall command which isn’t part of CentOS anymore by default. The RPM package also created a file in /etc/profile.d/openlava.sh which sets a few environment variables in order for openlava to function properly. To load those variables, we need to login again, su to the same user or simply source the script once manually. For all next times you log in to the machine, the script should be loaded automatically. As you can see in the above output, node02 has node01 as it’s master because of the order in the configuration file. Everything seems to be running fine so let’s submit our first job on both nodes. You can submit jobs using the bsub command. The command takes a lot of arguments since it defines all conditions and options that have to do with the job. The complete syntax can be found here. [jensd@node01 ~]$ bsub -m "node01" "hostname;whoami;sleep 60"
Job <210> is submitted to default queue <normal>. 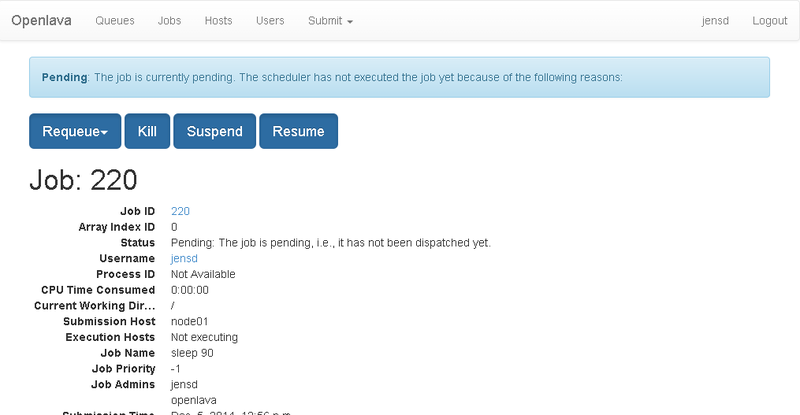 In the output we can see that the job was added to the queue called normal and ended up in the status PEND (pending). Shortly after that, the status changed to RUN (running) and after the job completed it got status DONE. Job <hostname;whoami;sleep 60> was submitted from host <node01> by user <jensd>. Job was executed on host(s) <node01>, in queue <normal>, as user <jensd>. </home/jensd> was used as the home directory. </home/jensd> was used as the working directory. CPU time : 0.01 sec. The mail contains the job output, saying the result of hostname and whoami. [jensd@node01 ~]$ bsub -m "node02" "hostname;whoami;sleep 60"
Job <211> is submitted to default queue <normal>. The mail contains very similar output like our first job, only the output was different since the result of hostname was different to show that it actually ran on the second node. [jensd@node01 ~]$ bsub -m "node01" -J first_job -b 20:30 "hostname;whoami;sleep 60"
Job <212> is submitted to default queue <normal>. [jensd@node01 ~]$ bsub -m "node02" -J second_job -w'done("first_job")' "hostname;whoami;sleep 60"
Job &lt;213&gt; is submitted to default queue &lt;normal&gt;. Now that our scheduler is up and running and we know how to submit and control jobs, it could be nice to get a good overview with a GUI. A web interface was made for openlava called Openlava web so let’s get this up and running on the master. remote: Counting objects: 636, done. Receiving objects: 100% (636/636), 3.03 MiB | 524.00 KiB/s, done. Resolving deltas: 100% (411/411), done. Adjust the lsfdir variable to search in /opt/openlava-2.2, the path that was used during the RPM-installation. Next is the webgui itself. remote: Counting objects: 2187, done. Receiving objects: 100% (2187/2187), 1.07 MiB | 205.00 KiB/s, done. Resolving deltas: 100% (1383/1383), done. This interface already allows you to list all information from the scheduler and see running and pending jobs but logging in and changing anything won’t work yet. We need to talk with openlave as root and that can’t be done using the Django WSGI. In order to control openlava with the webinterface, we need to use FastCGI and that can be started as root. To connect to the FastCGI-server, we need to place a webserver in front of it which redirects our requests to the FastCGI from our Django project. To do this, we will use Lighttpd. Lighttpd was already installed in the very first step of this post so the only thing that’s left is to configure it and start it. Now connect to the ip or hostname of node1 and go to http://node01/olweb to get to the web interface for openlave using Lighttpd. This is basically all that it takes to install openlava and configure it with a web interface. The web interface can probably installed in a better way but this is how I got it working since my knowledge of Django is very limited. For everything to work after a reboot, you need to enable the lighttpd service and create a service entry for the FastCGI of the Django project. This entry was posted in CentOS, Linux, Scheduling by jensd. Bookmark the permalink. Excellent write up, rather than editing setup.py you can also run LSF_ENVDIR=/path/to/openlava python setup.py install if openlava is not installed in /opt/openlava, I will update setup.py to look in the default rpm location too. As far as I know, the command before the copy: “sudo django-admin startproject openlava_webui” should create the manage.py. When I try to install openlava-python, it fails spectacularly. Did something change? It would seem that the syntax has changed in gcc or something. If you add “myorigin = $mydomain” to the top of main.cf you will not need to add any aliases. If the node is a send only postfix host then I recommend the following added to the top of the file. Update: I was right with the LD_LIBRARY-PATh environmental variable. Although I defined it the linker couldn’t find it. So i defined it in /etc/ld.so.conf –> updated ldconfig and repeated the procedure…now it is working!!! HI .. 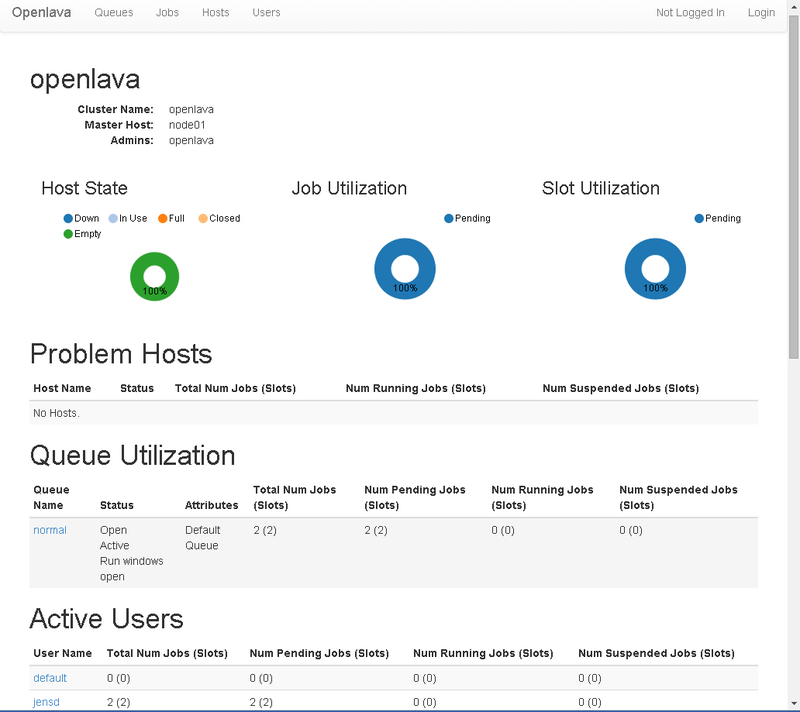 Wanted to try OpenLAVA as our HPC clustering solution. I am looking kind of software where i can build my Master .. install cluster software (OpenLAVA) and master to my new brand node machine which can be pushed thru the network boot on node machines. How can i do this thru using OpenLAVA. Please suggest. I’ve already resolved the “/opt/openlava-3.0/include/lsbatch.h” issue and the “liblsf.so.0: cannot open shared object file: No such file or directory” issue. Reloaded from scratch with CentOS 7. Same exact error message on web page. Unable to get list of queues. Ran into the “/opt/openlava-3.0/include/lsbatch.h” issue and the “liblsf.so.0: cannot open shared object file: No such file or directory” issues as well during the install. Probably there have been some changes in the packages. I haven’t got a lot of time recently to spend time on this. I would need to look into it a little better to give you some useful information. I am having the exact same issues as Bob on a fresh minimal CentOS7 install. I also had the “/opt/openlava-3.0/include/lsbatch.h” issue and the “liblsf.so.0: cannot open shared object file: No such file or directory” issues and corrected them. Just an additional note, I just built a clean CentOS 6 box and tried it on that, same error. So both CentOS 6 & 7 are affected. you have the same name twice and it complains about it already existed, perhaps this is causing some issues? Could you please explain how you resolved “liblsf.so.0: cannot open shared object file: No such file or directory” issue? Looks like I resolved the issue. i still had this question “Unable to get list of queues: Failed in an LSF library call”, somebody could help resolve it? I too have the exact same problem. My assumption is that too much has changed between 2.2 and 3.3 for OpenLavaWeb to work with 3.3. I pulled 2.2 from the openlava github project and build from those sources, that allowed me to get the webserver up and running again. If anyone knows the latest version of OpenLava that works with openlavaweb I would greatly appreciate the information so I don’t have to keep trying (I’ve already tried 3.3 and 3.0). It not worked for me. Guys help me to resolve this/. ase supply the ENGINE value. Check settings documentation for more details.